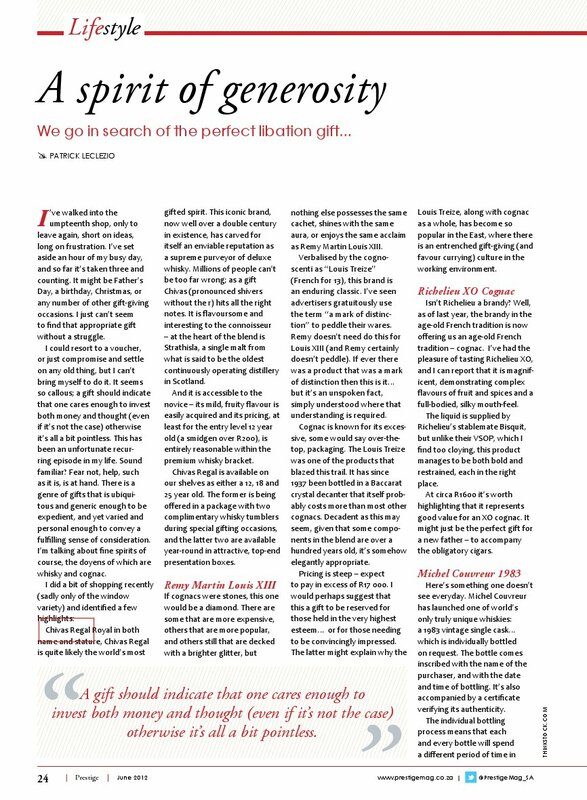 First published in Prestige Magazine (June 2012 edition). As it appeared – page 1. As it appeared – page 2. I’ve walked into the umpteenth shop only to leave again, short on ideas, long on frustration. I’d set aside an hour of my busy day, and so far it’s taken three and counting. It might be Father’s Day, a birthday, Christmas, or any number of other gift-giving occasions. I just can’t seem to find that appropriate gift without a struggle. I could resort to a voucher, or just compromise and settle on any old thing, but I can’t bring myself to do it. It seems so callous; a gift should indicate that one cares enough to invest both money and thought (even if it’s not the case) otherwise it’s all a bit pointless. This has been an unfortunate recurring episode in my life. Sound familiar? Fear not, help, such as it is, is at hand. There is a genre of gifts that is ubiquitous and generic enough to be expedient, and yet varied and personal enough to convey a fulfilling sense of consideration. I’m talking about fine spirits of course, the doyens of which are whisky and cognac. I did a bit of shopping recently (sadly only of the window variety) and identified a few highlights. Royal in both name and stature, Chivas Regal is quite likely the world’s most gifted spirit. This iconic brand, now well over a double century in existence, has carved for itself an enviable reputation as a supreme purveyor of deluxe whisky. Millions of people can’t be too far wrong; as a gift Chivas (pronounced shivers without the r) hits all the right notes. It is flavoursome and interesting to the connoisseur – at the heart of the blend is Strathisla, a single malt from what is said to be the oldest continuously operating distillery in Scotland. And it is accessible to the novice – its mild, fruity flavour is easily acquired and its pricing, at least for the entry level 12 year old (a smidgen over R200), is entirely reasonable within the premium whisky bracket. Chivas Regal is available on our shelves as either a 12, 18 and 25 year old. The former is being offered in a package with two complimentary whisky tumblers during special gifting occasions, and the latter two are available year-round in attractive, top-end presentation boxes. If cognacs were stones, this one would be a diamond. There are some that are more expensive, others that are more popular, and others still that are decked with a brighter glitter, but nothing else possesses the same cachet, shines with the same aura, or enjoys the same acclaim as Remy Martin Louis XIII. Verbalised by the cognoscenti as “Louis Treize” (French for 13), this brand is an enduring classic. I’ve seen advertisers gratuitously use the term “a mark of distinction” to peddle their wares. Remy doesn’t need do this for Louis XIII (and Remy certainly doesn’t peddle). If ever there was a product that was a mark of distinction then this is it…but it’s an unspoken fact, simply understood where that understanding is required. Cognac is known for its excessive, some would say over-the-top, packaging. The Louis Treize was one of the products that blazed this trail. It has since 1937 been bottled in a Baccarat crystal decanter that itself probably costs more than most other cognacs. Decadent as this may seem, given that some components in the blend are over a hundred years old, it’s somehow elegantly appropriate. Pricing is steep – expect to pay in excess of R17 000. I would perhaps suggest that this a gift to be reserved for those held in the very highest esteem…or for those needing to be convincingly impressed. The latter might explain why the Remy Treize, along with cognac as a whole, has become so popular in the East, where there is an entrenched gift-giving (and favour currying) culture in the working environment. Isn’t Richelieu a brandy? Well, as of last year, the brandy in the age-old French tradition is now offering us an age-old French tradition – cognac. I’ve had the pleasure of tasting Richelieu XO, and I can report that it is magnificent, demonstrating complex flavours of fruit and spices and a full-bodied, silky mouth-feel. The liquid is supplied by Richelieu’s stablemate Bisquit, but unlike their VSOP, which I find too cloying, this product manages to be both bold and restrained, each in the right place. At circa R1600 it’s worth highlighting that it represents good value for an XO cognac. It might just be the perfect gift for a new father – to accompany the obligatory cigars. Here’s something one doesn’t see everyday. Michel Couvreur has launched one of world’s only truly unique whiskies: a 1983 vintage single cask…which is individually bottled on request. The bottle comes inscribed with the name of the purchaser, and with the date and time of bottling. It’s also accompanied by a certificate verifying its authenticity. The individual bottling process means that each and every bottle will spend a different period of time in wood, and, as a result, will in theory be a different and unique whisky. Couvreur is a whisky artisan of long standing, based in Burgundy in France, and known in particular for his highly cultivated maturation process, in which he ages Scottish new-make spirit in individually selected Solera sherry casks. He and his small team are the remnants of an almost-forgotten golden era of whisky craftsmanship. The Couvreur range of whiskies was launched in South Africa last year and is available in strictly limited quantities. The 1983 retails for R4999. Glenmorangie is one of the “maisons” in the LVMH group – the world’s largest single owner of luxury brands, and home to epic labels such Louis Vuitton, Dior, and Bulgari. One would thus expect the guys at Glenmorangie to exhibit a swaggering command when it comes to gifting. And indeed they don’t disappoint – every year bringing out gift offers that set a benchmark for the industry. Their latest gift-pack whilst not their best is compelling nonetheless. It’s a beautifully designed carton containing a bottle of Glenmorangie Original, and a complimentary dinky bottle of Nectar D’Or, an expression from the brand’s pioneering extra matured range (this one specifically was finished in Sauternes casks). Pricing is at around the R400 mark. 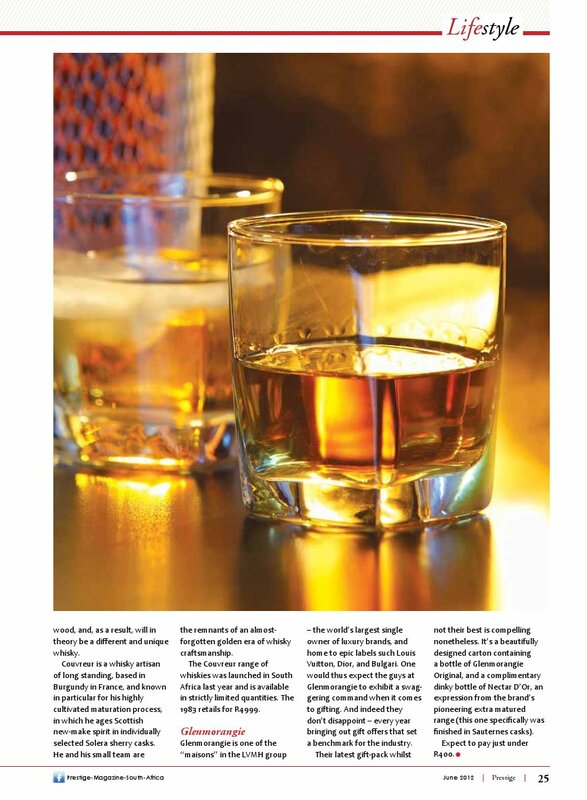 This entry was posted in Spirits column and tagged brandy, Chivas Regal, Cognac, Glenmorangie, Michel Couvreur, Remy Martin, Richelieu, Whiskey, Whisky. Bookmark the permalink.